Your personal information is valuable and can be used by other people to assume your identity and commit fraud. Key personal information such as your name, address, date of birth, Social Insurance Number, driver’s license number, credit card or banking information can be used to steal your identity, withdraw money from your accounts or open new ones, make purchases, apply for credit cards or loans, redirect mail or obtain employment. Identity theft can leave a victim with bills, a poor credit rating and a ruined reputation. Additionally, it can be time consuming to deal with financial institutions and police to correct the problem and clear your name. March is Fraud Prevention Month, a time to raise awareness about the importance of protecting yourself from identity theft and fraud. Most banks and other financial institutions issue credit and debit cards with radio frequency identification (RFID) chips that contain our personal information. Many of these cards are "contactless" to help speed small financial transactions. With contactless cards, we can wave or tap our card on or near a store's payment terminal and our transaction will automatically be processed without the need to provide a signature or enter a personal identification number (PIN). While this technology makes it easier for us to pay for purchases, it also makes it easier for hackers or electronic pickpockets to obtain our personal information. With a simple downloaded application, hackers can use their smartphones or tablets to read the information contained on our cards, including our name, credit card number, CVV (the 3-digit number on the back of a card), and the card's expiry date. If your card displays the contactless card symbol (a series of curved lines) or has a phrase like PayPass, Speedpass, payWave, ExpressPay, or Interac Flash, your card is one that can be waved or tapped to make a payment. If you are not certain if you have a contactless card, contact your bank or other financial institution for clarification. 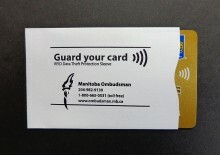 Manitoba Ombudsman has "ID shields" to help protect against identity theft and fraud. The shields, made of metallized, water-resistant, and tear-resistant paper, are designed to protect against unauthorized access to the personal information contained on your card's radio frequency identification (RFID) chip. If you would like us to send you an ID shield, please call 204-982-9130, 1-800-665-0531 (toll free in Manitoba) or email ombudsman@ombudsman.mb.ca with your request.